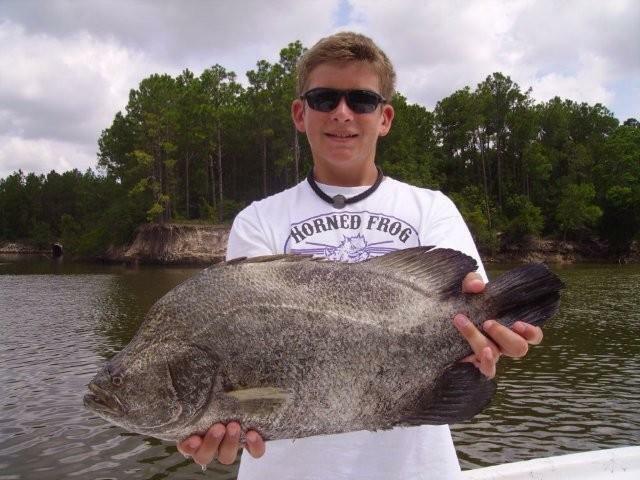 Tripletail (Blackfish) are, in my professional guide opinion, the coolest fish species on the Alabama Gulf Coast. I feel like they are sort of the inshore version of Cobia. It's not that they look the same, or even remotely close, for that matter. The similarity in these very different fish lies in the method of capture. Like Cobia, Tripletail are often found around structure. When Cobia fishing, the offshore anglers cruise around looking to spot a Cobia swimming just beneath the surface of the water. These fish are commonly found accompanying turtles, rays, other cobia, and are also found around underwater man made structures. When a Cobia is spotted, the most effective way to trigger a strike is to free line a live bait in the fish's close vicinity. With the Tripletail, moving from structure to structure like channel markers or crab traps is the way to find them. The behavior that Tripletail display that is unique to this fish is the propensity to lie on its side just below the water's surface. They do this to trick smaller fish into thinking they are a piece of structure themselves. As you would send a bait to a Cobia, we do the same with the Tripletail. Live shrimp, pogies, threadfins, crabs, or just about any small fish free lined in the face of a Tripletail is too much to pass up. The hardest thing about capturing a Tripletail is the first 10 seconds. These fish have the ability to peel off an extraordinary amount of light line in a very quick burst of strength and speed. Whatever structure you find the fish around, you have to get him away from it - Quick. We fish a heavier line on a high speed reel mounted a rod with plenty of back bone for Tripletail. The heavier line helps to cut down on break-offs when pulled across whatever structure the fish would try and wrap around.